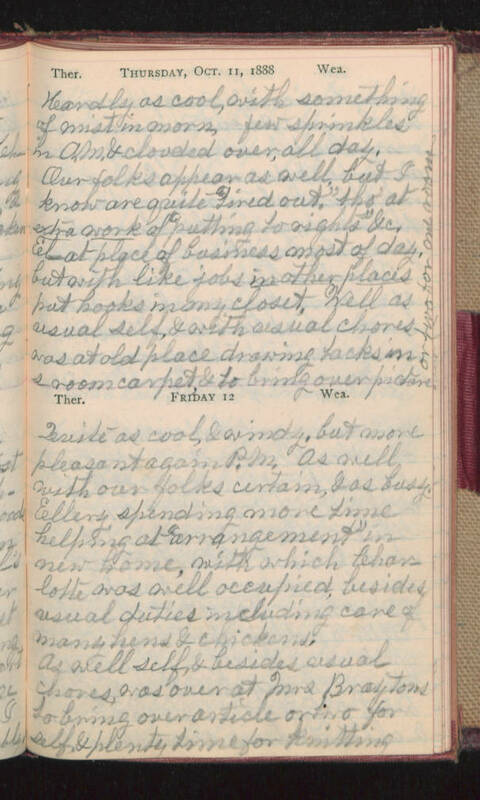 Thursday, Oct. 11, 1888 Hardly as cool, with something of mist in morn, few sprinkles in A>M. & clouded over, all day. Our folks appear as well, but I know are quite "tired out" tho' at extra work of "putting to rights" &c. El- at place of business most of day, but with like jobs in other places put hooks in my closet. Well as usual self, & with usual chores was at old place drawing tacks in s-room carpet, & to bring over picture or two for one room. Friday 12 Quite as cool, & windy, but more pleasant again P.M. As well with our folks certain, & as busy. Ellery spending more time helping at "arrangement" in new home, with which Charlotte was well occupied, besides usual duties including care of many hens & chickens. As well self, & besides usual chores was over at Mrs Braytons to bring over article or two for self, & plenty time for knitting.